Kimry Jelen’s brush strokes are a journey, not a destination. 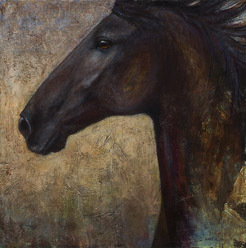 Her paintings express a love of working with horses, and are made all the richer for the individual connection she has with each animal. She is a firm believer that the balance between her work training horses and her career as a painter is essential to her happiness and productivity. 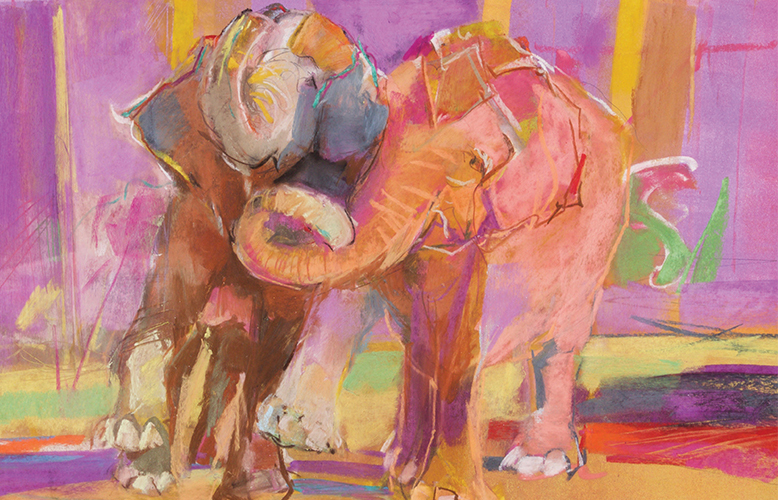 The deep hues and rich colors of her pallet create intimate portraits of the majestic animals, all inspired by the astonishing array of colors she finds in the mountains outside her Sisters studio. She has always been drawn to horses and explains getting her first horse at 16 was a pivotal moment. “Art and horses were my loves growing up,” she said. The two passions finally came together in Montana. I started painting for fun again, started to get back to my roots,” Jelen stated. While she was learning the horse trade, she became more and more confident in her paintings, creating a powerful combination that stands in her life today. A move back to Portland for family reasons prompted her to tap into the numerous opportunities to take art classes. 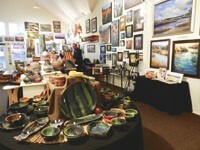 “I was self taught until that time, and I thought I should learn how to use the mediums,” she explained. “I took weekend workshops, and during a figure drawing class one afternoon when we were drawing a women who was on her side, [I thought] her hip, waist and shoulder looked like a horse; the outline looked like the back of a horse, so I started drawing a horse instead of the model. After that I started painting horses, it just kind of happened. “I felt like it fell into place, I couldn’t stop, I just wanted to keep painting horses,” Jelen said. 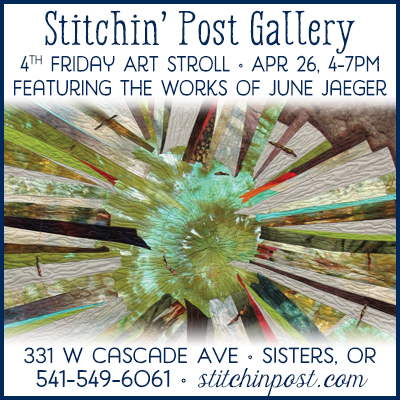 After that time she began showing at the First Thursday art walk in Portland, and that opened doors to other shows. 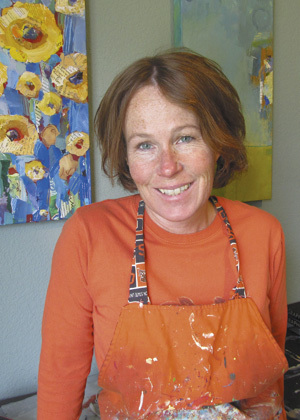 Jelen moved to the high desert about 10 years ago to train horses and continue painting, mostly for fun. “I had several trainer jobs and did the art on the side, then I started doing freelance training and it became more half and half,” she said. The perfect balance in Jelen’s life consists of time spent training, which feeds into her artwork, and concurrently her artwork nurtures the time spent training horses. “I can’t have one without the other. I don’t think the paintings would be as inspired,” she said. 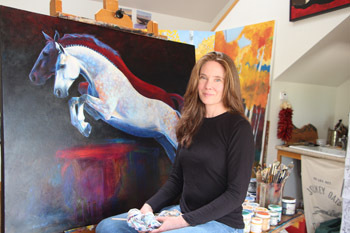 This year she was the only American artist invited to the World Equestrian Games in France. Athletes from 60 nations competed for medals in jumping, dressage, para-equestrian dressage, driving, endurance, reining and vaulting, and Jelen displayed her artwork during the duration of the event. “The European artists’ art contained more earth tones, and that made my wall just pop out. People would step back when they looked at my artwork compared to everything else, and it made me realize in some ways my paintings feel more like sculpture with color. I’ll get a lot of texture because there are many layers of different colors. I’ll start with a color like orange, and then work in blue, and keep painting in complementary colors back and forth,” she explained. When Jelen begins a new painting, the white canvas has to go. “I might start by copying a painting I like from one of the impressionists or expressionists…but I need to paint a bit to get into the groove, just to get painting and seeing again. 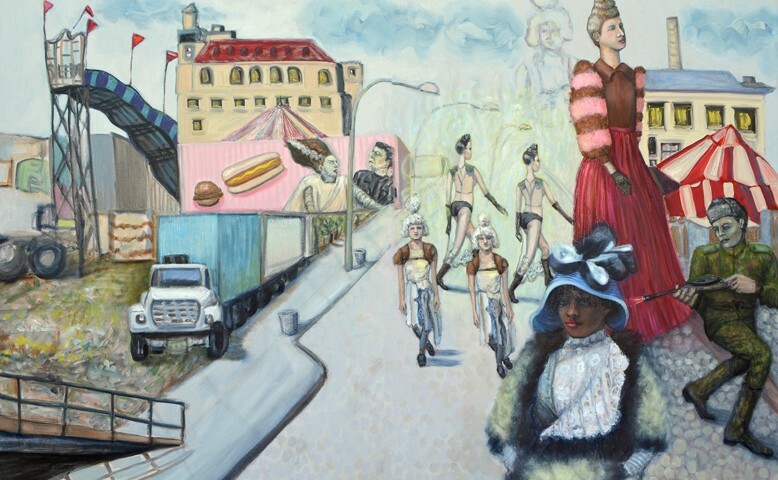 Quite often there are three or four paintings under each of my finished works,” she explained. In the future Jelen would like to use her artwork to broach the subject of animal habitats. “When you open up access to the environment, people start noticing when it’s gone. I think it would be nice to somehow incorporate that idea with migration of wildlife to make a difference in the world with my art. “I want to further people’s awareness of nature so it doesn’t vanish; it is so important because nature inspires me and keeps me going. I need to be able to ride in the mountains and not trespass [on private property] or have to obey all sorts of rules. I want to keep it wild.